If you were going to build a farmhouse you probably wouldn't be able to find a location as ideal as Old Salt Farm. 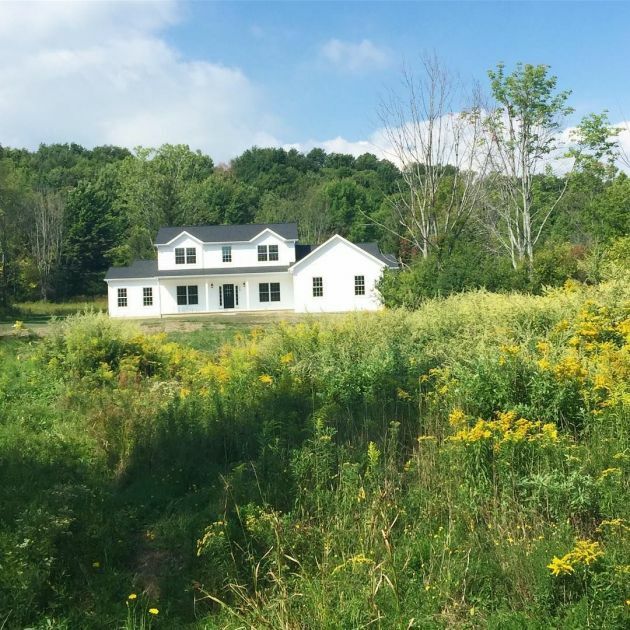 This newly-built farmhouse is set in upstate New York in the foothills of the Appalachian Mountains amid an abundant forest of trees and rolling green hills. The Wade family, consisting of Kierste and her husband, six children, including two sets of twins, wanted a home that offered them a certain measure of privacy and plenty of room to grow. The two-storey farmhouse is built accommodate and make the lives of the Wade family a little easier. A large mudroom allows plenty of space for boots, shoes and jackets, as well as hopefully corralling the impending mud and snow to one area of the home. The inclusion of 6 bedrooms ensures that the family can spread out, as well as accommodate visitors throughout the year. The roomy eat-in kitchen and attached pantry makes storing, preparing and serving food more efficient and organized. Additional details like sliding barn doors in various areas of the home add a custom touch. The black front door adds some much needed contrast to the home's all-white exterior. Customized storage cubbies in the mudroom, labeled 1 through 6, provide each child with a place to store their belongings. A wide hallway, with barn doors on either side creates easy access to the home's other rooms. The home's white interior and glossy hardwood flooring makes the transitional spaces feel light and airy. Behind a set of sliding barn doors is an organizer's dream, a pantry designed to keep everything in its space. The kitchen island and bench make a perfect bar for casual breakfast or, as often is the case, kitchen chats during dinner prep. The kitchen's farmhouse sink is positioned perfectly in front of 2 large windows allowing those working at the sink a view of the outdoors. A rectangular farmhouse table and benches ensure that this family of 8 can all fit around the supper table. Still a work in progress, the humble master bath design is another way Wade puts family time first. The stool and large mirrors invite her daughters to come in and sit to get their hair done before school. Rather than a private sanctuary, she designed her bathroom to get a few minutes of quiet one-on-one time with her children to start the day. Share the custom details of this New York farmhouse with your friends on Facebook.